Hi Guyz, is Article me Roman Reigns ke related kuch information share karunga Why Roman Reigns Left WWE and his Tittle, sabhi WWE dekhne wale Roman Reigns ko zarur jante honge. Roman Reigns WWE ke successful Superstars me se aik hain But 22 October 2018 ka din Roman Reigns or WWE ke Fans ke liye bari Aafat ka din tha B'coz 22 October ko Roman Reigns ke Fans ko kafi Bad News mili hai. 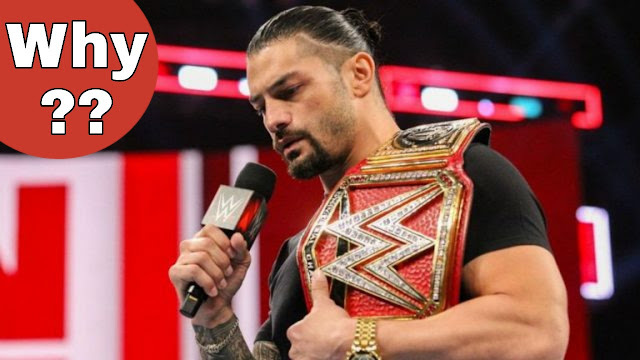 Roman Reigns ki is Bad News se Puri Wrestling community or Romans Reigns ke Fans kafi upset ho chuke hain, ye kia Bad News thi jisne puri Wrestling community or world me hungama kar diya is Bad News ko discuss karte hain. Roman Reigns ne 22 October ko apna Universal Championship ka Tittle chor diya, is faisle ke bad har taraf yahi batein thi or yahi sawal tha ke Roman Reigns ne ye kyun kiya hai, Roman Reigns apne is faisle ko explain karne ke liye Ring me aagaye or kehne lage. And na chahte huwe bhi me Ring me fight nahi kar sakte hain, Roman Reigns ne ye bhi btaya ke wo jab 22 years old the tab se ye Bimari unke saath hai or wo time mere liye Aafat se kam nahi tha B'coz us time par mere pas koi job nahi thi us time par WWE ne mera sath diya or mere sab dreams pure ho gaye or iske bad apne sabhi Fans ko Thanks kaha"
Roman Reigns ki emotional speech ke bad Roman ke Fans Thank you Roman kehne lage, again Roman Reigns kehne lage "Ye meri Retirement speech nahi hai or jaldi is Bimari se fight karne ke bad Ring me fight karunga or me Ring me Fight apne Fans ko ye btane ke liye karunga ke jab Life me koi problem aati hai to us se fight karni chahiye or dobara apne Fans ko Thank you kehte hain"
Roman Reigns ki Speech End hone par again Roman ke Fans Roman ko Thank you kehte hain, But aik Question abhi rehta hai ke Roman Reigns ko konsi Bimari thi jiski waja se Roman ko apna WWE Career chorna para?? Roman Reight ko Leukemia ki Bimari hai, Luekemia actually Blood Cancer ko kehte hain or unfortunately Roman Reigns ko Blood Cancer ho chuka hai, And Roman Reigns ko Blood Cancer ka Treatment karwane ke liye WWE ko chorna hoga. And Roman Reigns ki 1 week se fight na karne ka yahi Reason tha, Now Roman Reigns ko Blood Cancer se fight karni hai or Ring me come back karna hai.